This Is Framingham » Blog Archive » Bronzetti’s is open! It was like waiting for Christmas (or Hanukkah) but the day finally arrived. It’s very much a mom and pop kind of place as the waitstaff must be family members and don’t wear uniforms but let you know when you walk in they’re there to serve you. Our waitress was very nice and another woman (Mrs. Bronzetti?) check up on us as well to make sure everything was alright. 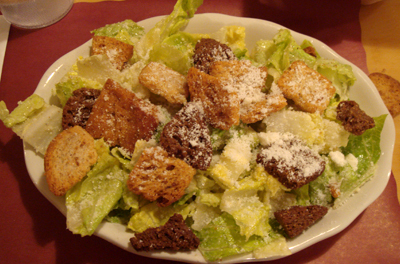 We started off sharing a caesar salad which they were nice enough to split onto two separate plates and were decent sized even as halves. The dough was nice and crispy on the bottom and the cheese perfectly browned on the crust. It’s just so good and was worth the wait! heard Chili’s is closing for good on April 29…. can you find out why and what will be replacing it?? The British Beer Works in Falmouth is fun and decent — better than Chilis. Hope it develops the same rep. in Fram., despite no ocean view. Whoo hoo! Tonight is a Bronzetti’s Night! Hit Bronzettis the other night and i was not disappointed. I have been in Framingham for a couple of years now. I have been looking for a really good, step above the rest type of pizza place for a while and I think I found it. I got a hamburg and onion and it was great. Love the crust, and hamburg. I was a little disappointed the bar wasnt open yet because I was jonesin’ for a brew. But the kid working said it would just be a couple of days until it opened. Im going to hit that place again soon. Where is this? Do they serve pizza by the slice or whole pies only? I tried it but was a little dissapointed, they didn’t cook it enough like the used to, I will have to ask for it a little crispier next time I try. LOVED IT-having it again tonight! I too was disappointed, maybe I am just spoiled from eating from superior pies which is 10 times better and alot cheaper! wow… This is for the comment left from the person only known as “ME”. Why were you disapointed? superior pies, whos that? I’m sure just a completely different kind of pizza and I’m sure pretty good. What would have made your experience better? Is 10.00 really to much to charge for a pizza? Your feedback is important to me!! Yesterday was my first visit to Bronzelli’s and what a wonderful place. It has been a long time since employees and waitstaff made me feel welcome. Food was wonderful and the pizza was to was we were looking for. Keep up the good work. They got the best cheese pizza I have had in ages. On top of that the service is awesome! If you are looking for a place you can relax and eat great food, this is the place! Hi B. Bronzetti…I’m assuming you are the owner of said establishment…if so, welcome! A quick note…I’ve never been to your establishment but I’m only 5 minutes away and always looking for a good pizza place. I called you guys today and asked if you have a web site. (i didn’t have a take-out menu and didn’t want to go there and wait for my food to be done). The person on the other end of the line said that you don’t so I made a longer trip to Gianni’s down Edgell Road…simply because you didn’t have a web site that I could browse and pick and choose my pizza and appetizer (and spent $21 at Gianni’s). That’s a little pet peeve of mine….restaurants that don’t have websites yet any high schooler can build one…I mean, you spend a good chunk of money on a business and from the reviews here, it seems like you have excellent food, why don’t you let the peeps see for themselves? and it dosen’t have to be fancy. 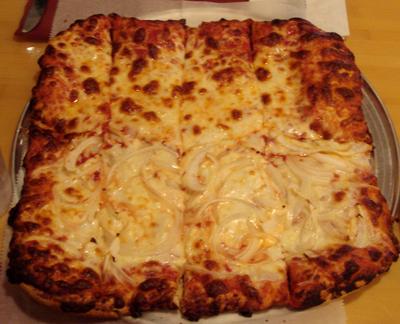 There’s a pizza place in Westborough that dosen’t have the greatest site, kinda basic, but it does the job. Ok…i guess it’s more that a quick note..:-)….but i look forward to checking you guys out!!! My wife and I agreed that the shaved steak and pepper pizza was simply the best pizza ever! This the best pizza in the Universe, period. It’s the old Union House recipe, only cooked to perfection each and every time (I guess I’ve had at least a few dozen pizzas here since they opened), which can’t be said about the old Union House…at least in its last few years (RIP). Of the square pizza tour in Framingham (LaCantina and the resurrected 400 Club), this is my No. 1 go to, especially if you like sausage and onion. LaCantina”turner” does still do the best pepperoni and onion, and the 400 has a nice meatball and shroom…but Bubba’s got them beat on his special crust, sauce and cheese base. Long May He Run. 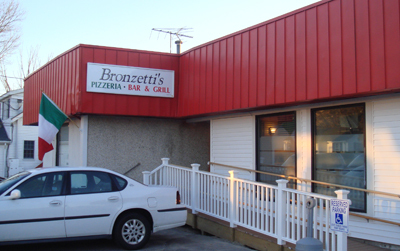 Join the Fans of Bronzetti’s in Framingham group on Facebook! This place is no better than chuckie cheeses.If you can get by the sticky unclean front door(glass hasnt been washed in two weeks)the urinals smell horrible,when the wind is right the stink leaches all the way into the bar area.As for the food Ive never seen two pizzas look the same.Some come out burnt some undercooked.As for the prices?C’mon guys 13 14 15 dollar dishes?for chicken?thats rediculous,even if the food was half as good as people think it is.Dont bring children there after 4,or else they might pick up a second langauge that will harm them in their proffesional career.And another tip,keep the kitchen help in the kitchen,instead of leering at all the guests.If they need something to do send them in the bathroom with a mop,that would be a start.People over exagerate the quality of the food here,one reason is they jump on the Bronzetti bandwagon to make themselves feel important,or they simply dont get out enough and don’t know what great food taste’s like or costs.This is not meant to be hateful,with some hard work this place can turn around to benefit everyone.I only speak the truth. Chuck E. Cheese? Really? Demetri, sounds likes you have a problem with the Bronzetti family. This is currently my favorite pizza place. I actually own another business just up the street, and we recently started having Bronzett’s supply us with 30-150 pizzas each week for our customers. That is a lot of pizza, and they all look the same to me. I myself consume at least a pie or two each week, and they all taste just as good as the first one I ate. As for the sticky front door and the smelly urinals, I know firsthand, how hard it is to maintain these two specific items in a high traffic business. it is amazing how people will treat a public restroom. But I digress…bottom line, all of my customers have been raving about the pizza and everybody walks out of our business with a Bronzetti’s menu in hand. Dont’ know what we’d do without you guys, keep up the good work B.B. Stoped by today it was closed locked up winodws papered over phone works but nobody answers? Web site is still up what happened anybody know?